Use the Electrical Tubing in tight quarters or where movement, vibration or constant flexing exists. Integral rigid and flexible PVC construction allows to bend back on itself, yet resists corrosion, oil and water. Cut it with a knife or PVC cutting tool for fast assembly. Available in 1/4" to 2' trade sizes. Need even tougher conduit? 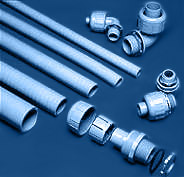 Flexible, Liquid Tight, Non-Metallic (UL Type B) Conduit is designed for use with metallic as well as non-metallic connections. Available in 3/8" to 2" trade sizes. The installer simply pushes the Electrical Conduit or Tubing onto the Connector ferrule then hand tightens the domed sealing nut. No disassembly means no lost parts! No possibility of cutting the tubing and creating leak paths. The Conduit and Tubing will not wind tight onto the Connector ferrule, so the installer can remove it without cutting and without damaging the Connector. Conduit size Part Number UL/CSA Std. Pkg. in Feet Weight per pkg. Also available in 1000 ft. & 800 ft. reels, respectively. Also available in 1-1/4", 1-1/2", 2".